Let's all paws for a moment to admire Black Cat Pez. Pezhead Monthly: Black Cat Pez, thank you for joining us. You are the latest Pez dispenser in the Halloween series, and if I must say so you are very well designed. Is it a bit intimidating to be joining one of the longest running and coolest series in the Pez lineup? 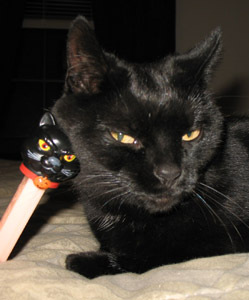 Black Cat Pez: Quite the opposite, sir. Each and every one of my fellow Halloween dispensers have welcomed me with open arms, or at least they would have if they had arms. Even Slimy Sid, who I had heard can be a bit difficult, was totally cool. I guess the only way it could have been a smoother was if some other dispensers were released along with me, such as an updated Frankenstein or Wolfman. After all, no one likes to go to a party alone. PM: I see your point indeed. So have you bonded yet with any of the other Halloween Pez? her. But which witch? I don't want to choose a particular one over another and cause any hurt feelings. I mean, there's the standard Witch C, the glow-in-the dark Witch, the 2003 Witch, the 3-piece Witch, and the Witch regular. And don't even get me started on the Misfit Witches. Witch, please! PM: I understand where you are coming from there. Shifting gears, and I'm not intending to get on your bad side, Black Cat Pez, but it seems from your furrowed brow that you are angry or frustrated at something in particular. So what's the deal? BCP: I knew this question would come up eventually. I may look mean an ornery, but I want to assure all Pezheads out there that I am ready, willing, and able to dispense fruity goodness to kids of all ages. It's just that sometimes the little things get to me. For example, when people drive and talk on the cell phone at the same time, that really stirs my stew. Same thing when someone with a cart full of groceries goes in the 15 items or less lane. Unless they are buying Pez, in which case that's okay. And if you think about it, have you ever met a cat without some kind of an attitude? PM: I suppose I have not, and your point is well taken. Now, I know that you are part of a Pez dispenser set that celebrates a frightful holiday. But is there anything in particular that you are afraid of? BCP: Overall, I'd say no. I always found that there's safety in numbers, like when kids go out together trick-or-treating, or when celebrities travel with their entourage. And there are plenty of other dispensers in the collection I am a part of, so it's not that scary. That being said, I'd be lying if my hair didn't stand up the first time I ran into German Shepherd Pez from the Emergency Heroes set. But I have since discovered that he loves getting his belly rubbed. What a big sweetie. PM: That is fascinating to be sure. 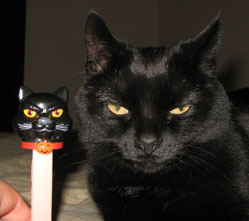 Finally, Black Cat Pez, as you make your debut this year, do you have any words of advice for people new to the hobby? BCP: I'm a modest dispenser and all, but I firmly believe that I would be a great start to any Pez collection. And for the more experienced collectors out there, get me while I'm hot because come November I understand that I will be very hard to come by. I know it's considered bad luck to let a black cat cross your path, but trust me, I am an exception to that rule. And if you should ever cross my path, it would be the purrfect opportunity for you to add me to your collection. "The power of Pez compels you! The power of Pez compels you!"